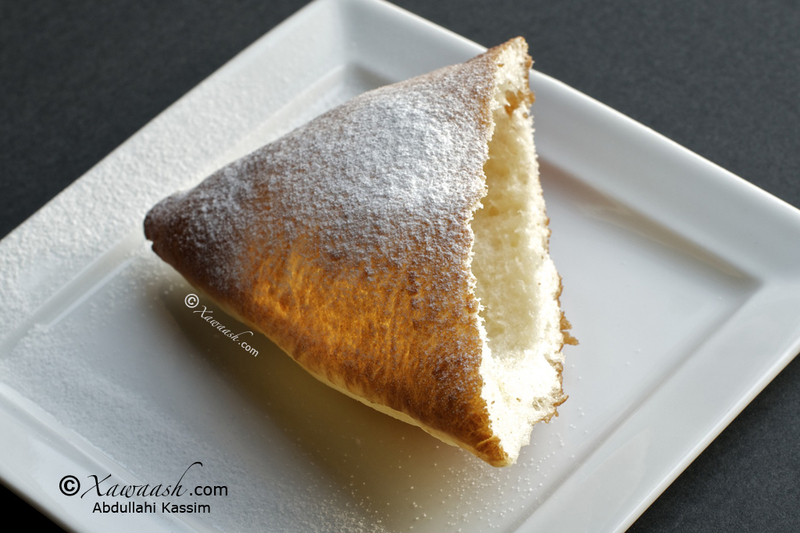 This triangular Sweet Fried Bread, known as Qamdi in Somalia, is similar to a doughnut but is less sweet. In cities across Somalia, qamdi as well as bur (Fry Dough) are common fare served in food stalls in marketplaces, in eateries spread along main thoroughfares, and is sold by street vendors. Qamdi originated in Swahili towns along the East African coast. 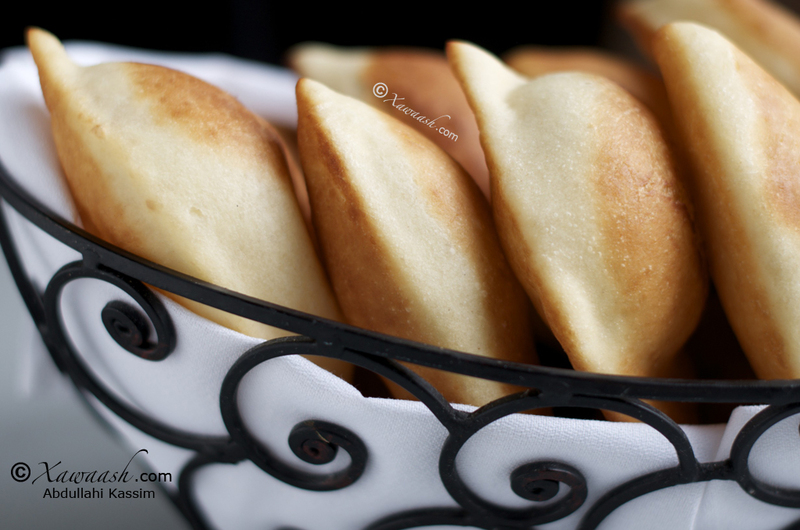 It is part of the East African Fried Bread family that includes mahamri and mandazi. There are as many recipes as there are names and variant spellings of these sweet fried breads: mahamri, mamri, mandazi, maandazi, maandaazi, qamdi (Somalia), khamdi (Somalia), ba khamri (Yemen). Some recipes replace the water in the recipe with milk or coconut milk. Some add powdered milk, and there are recipes that use baking powder instead of yeast. 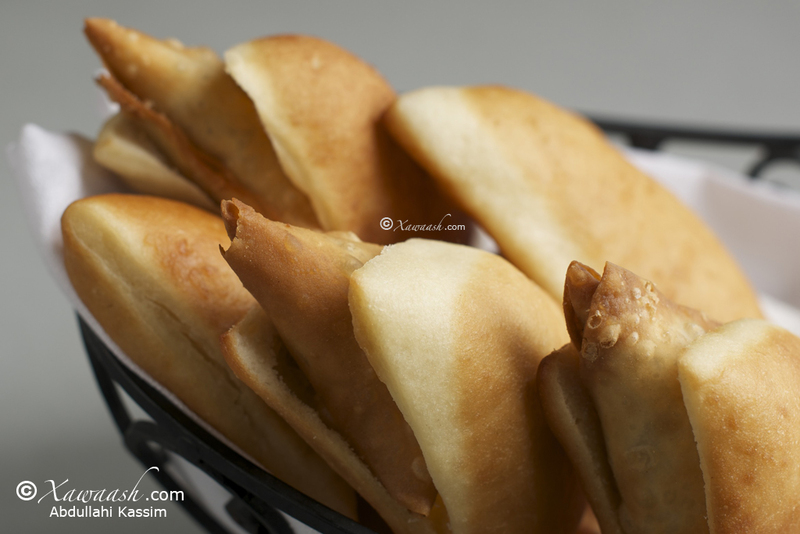 In Somalia, qamdi is paired with samosas or is eaten with a cup of shaah caddeys (spiced Somali tea with milk). It is not considered a bread as such, the way it is in Kenya and Tanzania, where it is common to use mandazi for scooping up maharage (cooked beans). 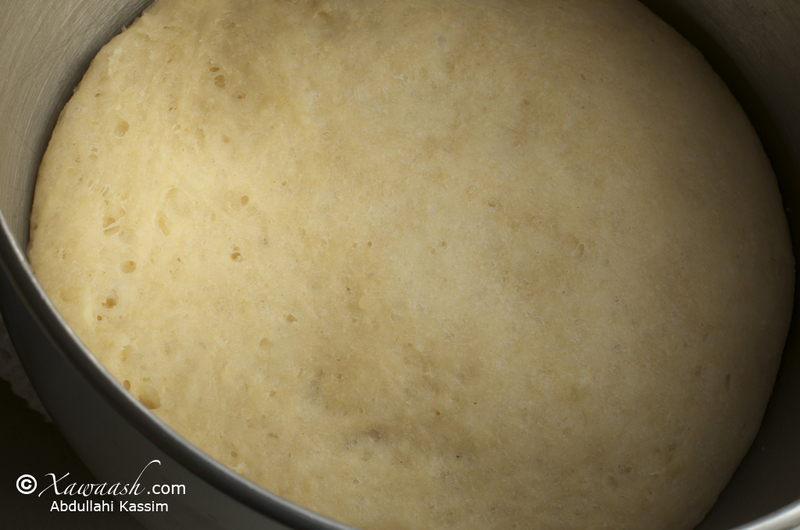 Qamdi dough was usually prepared a day ahead for it to rise overnight. This recipe uses instant dry yeast which cuts the prep time to 2½ hours. 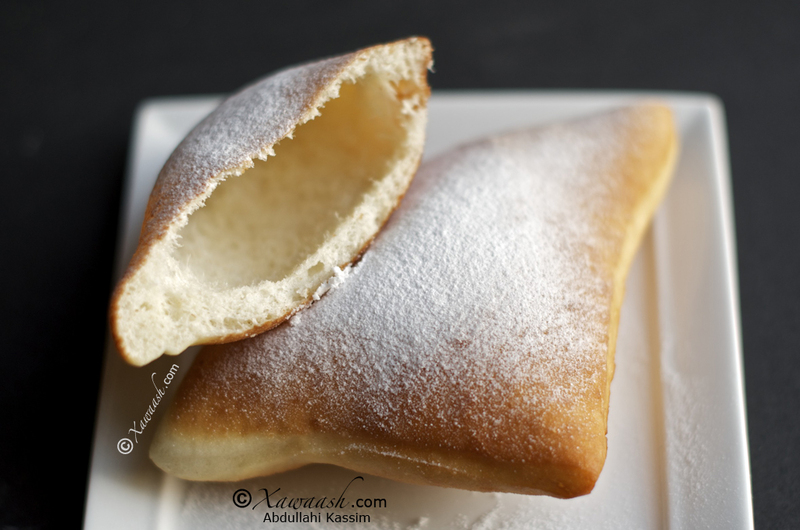 Le Pain Frit Sucré triangulaire, connu sous le nom de Qamdi en Somalie, est similaire à un doughnut mais en moins sucré. Dans les villes en Somalie, qamdi ainsi que bur (Pâte Frite) sont les nourritures que l’on sert d’habitude dans des stands sur les marchés, dans les restaurants qui parsèment les rues principales, et sont aussi vendus par les vendeurs de rue. Qamdi est originaire des villes Swahili de la côte d’Afrique de l’Est. Il fait partie de la famille des pains frits d’Afrique de l’Est qui comprend aussi mahamri et mandazi. Il existe autant de recettes différentes que de noms et d’orthographe pour ces pains frits sucrés: mahamri, mamri, mandazi, maandazi, maandaazi, qamdi (Somalie), khamdi (Somalie), ba khmari (Yémen). Certaines recettes remplacent l’eau de la recette par du lait ou du lait de coco. Certains ajoutent du lait en poudre, et certaines recettes utilisent de la levure chimique à la place de la levure (de boulanger). En Somalie, qamdi est servi avec des samosas ou avec une tasse de shaah caddeys (thé au lait épicé Somali). Il n’est pas considéré comme un pain à part entière, comme au Kenya et en Tanzanie où le mandanzi est utilisé pour attraper maharage (les haricots cuits). D’habitude on prépare la pâte à qamdi la veille pour qu’elle lève la nuit. Cette recette utilise de la levure instantanée qui réduit le temps de préparation à 2 heures et demie. Mix the yeast, ¼ cup of lukewarm water, and 1 teaspoon of sugar. Let it stand for at least 10 minutes for the yeast to activate. In a mixing bowl, place the flour, ½ cup sugar, the eggs, ½ cup water, the oil, and the activated yeast. 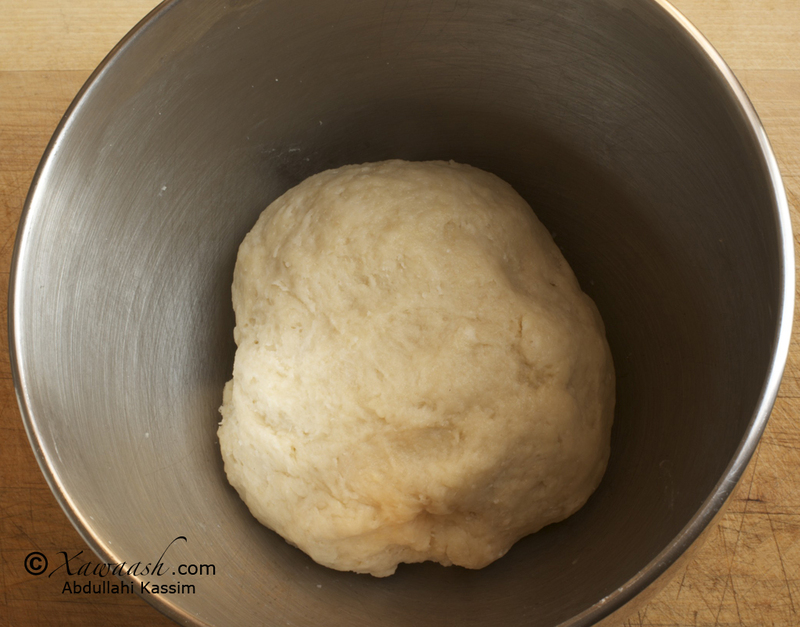 Mix, then knead the dough, forming it into a ball. Cover the dough and let it rest in a warm place for 2 hours. 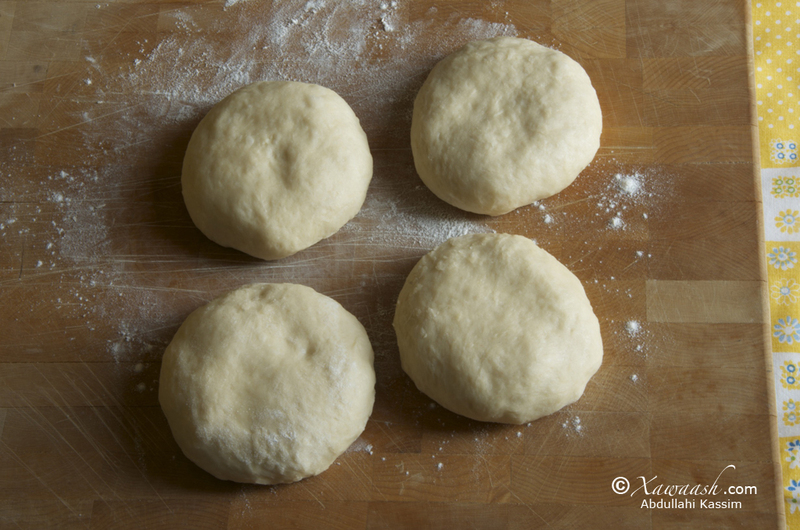 Divide the risen dough into 4 equal pieces and shape each piece into a ball. Press down the ball to flatten it into a disc. Using a rolling pin, roll out each disc into a circular shape of a ¼ inch thickness. Using a knife, cut each circle into quarters. Using a frying pan or wok, heat vegetable or canola oil on medium heat. Drop the qamdi into the oil and as soon as it surfaces, start splashing it with the hot oil to help it to puff up. Turn when the bottom becomes golden brown, about 1 minute. Fry the other side for another minute. Drain on a plate covered with paper towels. Mélanger la levure, ¼ de mesure d’eau tiède, et une cuillère à café de sucre. Laisser reposer au moins 10 minutes pour que la levure s’active. Diviser la pâte levée en 4 morceaux et façonner chaque morceau en une boule. Appuyer sur la boule pour l’aplatir en un disque. Avec un rouleau à pâtisserie, étaler chaque disque en un cercle de ¼ de pouce (0,64 cm) d’épaisseur. Avec un couteau, couper chaque cercle en quarts. Une fois la pâte ainsi préparée, la couvrir et la laisser reposer pendant 30 minutes. Dans une poêle à frire ou un wok, faire chauffer l’huile de colza ou l’huile végétale à feu moyen. Mettre le qamdi dans l’huile et dès qu’il remonte à la surface, l’arroser d’huile pour l’aider à gonfler. Retourner quand le dessous est marron doré, au bout d’à peu près 1 minute. Frire l’autre côté pendant encore une minute. Égoutter sur une assiette recouverte de papier absorbant. 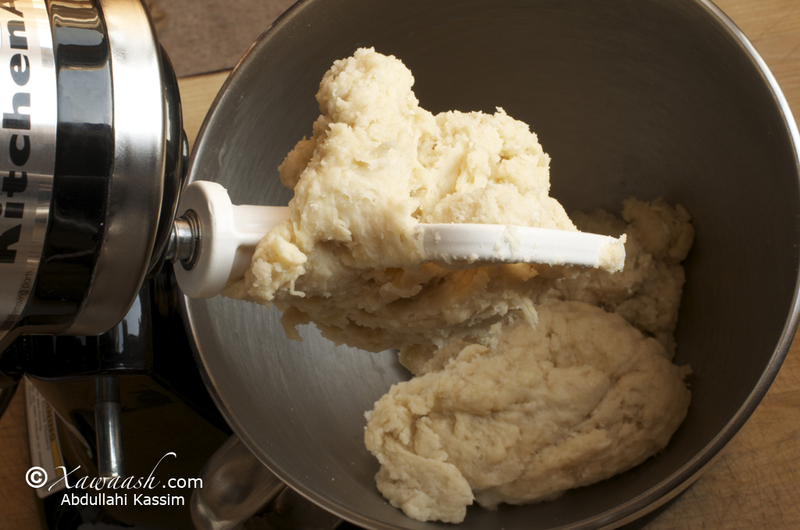 After preparing all the dough this way, cover and let the qamdi dough proof for 30 minutes. Après avoir préparé la pâte, couvrir et laisser la pâte à qamdi reposer 30 minutes. look at that hollow, wow.. this is new for me! Thank you for sharing! Thanks, Jessica. We see you have a great site! Thank you for your comment Anna. Happy exploring! These are beautiful! 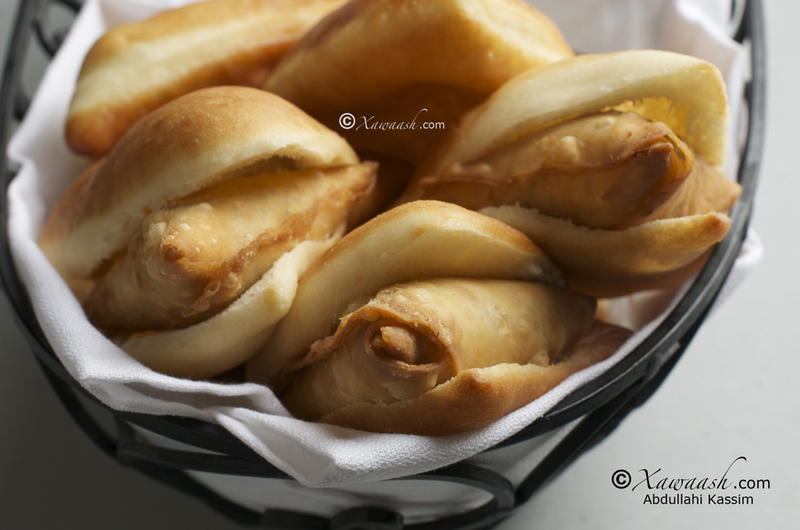 I’m amazed by how similar they are to a fried bread we love here in New Mexico, sopaipillas, which we serve plain with honey or stuffed with savory things like beans and meat. I know nothing about Somali food, but am definitely interested in learning more about it. Keep up the good work! Thank you very much Jennifer. 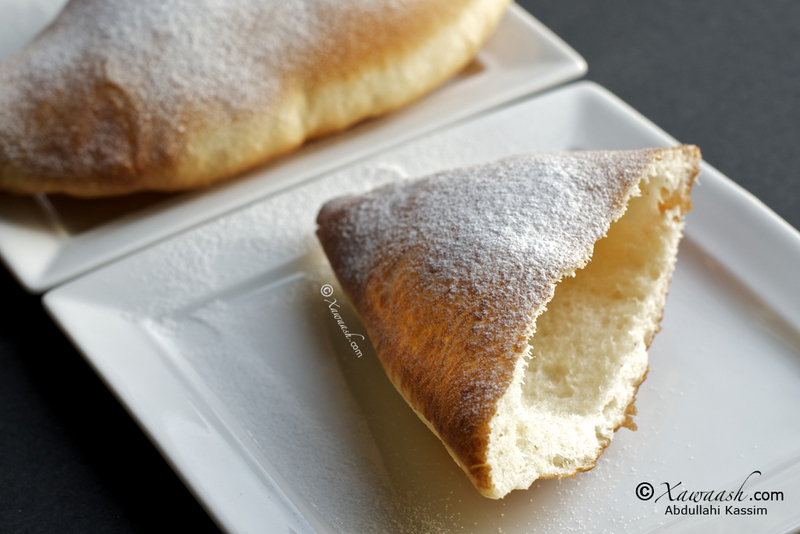 I just did a quick google search and yes they are similar to sopaipillas. The Wikipedia entry on sopaipillas says, “The word sopaipilla is the diminutive of sopaipa, a word that entered Spanish from the Mozarabic language of Muslim Iberian peninsula.” Our world is indeed interconnected. Yummy they are. Thanks for stopping by. During Ramadan, we make a large batch. We refrigerate some of the dough for 2 to 3 days and we freeze some. Do this after the dough proofs and make sure you bring the dough back to room temperature before using. Thank you so much for sharing these recipes. For the first time I enjoyed making soor and sweat fried breads. Please keep posting more recipes including Halwa making. We will post the recipe for Halwo soon, God willing. We are glad that you liked the recipes. I’m very happy not just happy but beyond happy to find this website (Somali food) every time you Google Somali food its difficult to find, but you guys you made excellent job however I’m really glad to find you’re website come-on people it’s time to shine Somalian food. I tried some of your recipes and I like them very much, however I fail to make the mandazi like you did in the video, I did watch several times the video and I don’t know where I got wrong. When I made my mandazi it needed more water I mean it was a bite dry the dough and I added more water but it was tasty and everyone enjoyed. So any suggestion plz help. We’re happy that you like the website. Thanks for the comment. For this recipe and many others, it’s important to follow the directions exactly, especially the measurements. Use a measuring cup and measuring spoons. That way you will be guaranteed perfect results every time. Hadduu Illaahay yiraahdo kulligooda waan soo gelin doonnaa. So glad i found this recipe, my husband and kids adore these. My husband calls them somali doughnuts. I love the website, great tool for hopeless people like me who have lost most of their culture. While I may not be able to pass on the language, so glad i can at least pass on bravanese food to my kids, and impress my mum next time she visits. Many thanks for taking the time to put up these recipes. Thank you for the comment. We are happy that you are able to make our traditional foods and serve them to your family. Wacalaykum assalaam. Burka waa in la-levelgareeyo. Waxaad fiirisaa video-ha canjeerada. Sida ugu fiican waa inaad qaaddo ku-buuxisid koobka. Lama rabo in koobka xoog loo daro oo uu koobka cuslaado. Burka waxaa la-rabaa inay hawo ku jirto (airy). Qamiirka 1/4 koob biyo ah maku-qastay? Oo hadhoow burka 1/2 koob biyo ah maku-dartay? Ugu dambayn, koobka aan isticmaalno waa 237 ml, qaaddadana waa 15 ml. Ukunta aan mar walba isticmaalno waa tan weyn (large), ma’ahan ‘extra large’. Thank you so much for your comment. We enjoyed reading every word of it. Thank you. For someone who grew up in the U.S., you are lucky to know how to cook Somali food. Kudos to your parents or whoever taught you how to cook. We believe that bandhaase is the Somalization Mandaazi which is Qamdi. 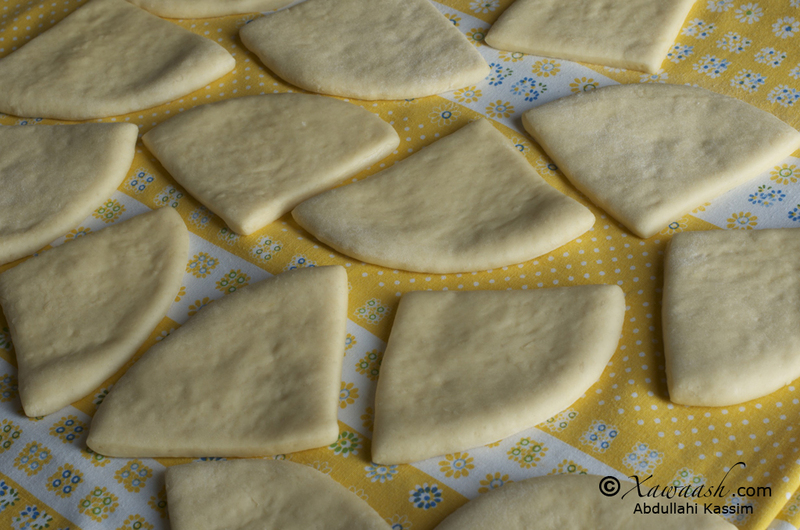 We hope to post more recipes of traditional Somali sweets and pastries. We have a long list that we hope to cover quickly, but both of us work full time and we wish the day had more than 24 hours! Thank you for your prayers and we wish you well. May God grant you your wishes and may He protect you and your family. Waad ku mahadsantahay hadalladaada fiican oo qiimaha leh. Thank you very much for the nice comment. We use Kitchenaid, but you can use any brand you like. You can find mixers at Walmart and many other places. Hadduu Eebbe idmo mar dhow ayaan soo geling doonnaa. Waa ku-mahadsan tahay salaanta qiimaha badan leh. Aad ayaan ugu faraxnay inaad ka-faa’iidaysatay xawaash. Waa ku-mahadsan tahay faalladaada fiican. Ramadaan kariim adiga iyo inta London naga daawata oo dhan. Waxaa isticmaashaa 1/2-ka ugu hooseeya koobka. 1/2-ka u-dhexeeya 1 iyo 2 waa hal koob iyo nus (1 1/2). Ha ka-walwalin, su’aasha aad qabtid na-weydii. We don’t use Instagram but we are on Facebook. Search for Xawaash on facebook. We will email you, God willing. Thank you for your comment. Can this recipe be used to make bread. It cannot be used to make bread. We will post a recipe for pizza very soon and that dough can also be used for making bread. Ramadan Karim. Thank you for sharing your experience with us. We are happy we could help. JZK for your time & effort you put into this, masha’Allah words could never express the asset this blog is to our family & Somali society as a whole. With that said, a friend had mentioned there’s a version of this without eggs & replaced with coconut milk but of course she has no measurements lol so I cannot just go by that. Would you happen to give me measurements for the ‘no eggs’ version? I’d greatly appreciate it, JZK! Thank you so much for your generous compliment. It will definitely give us a boost. You make our efforts worthwhile. The reason we took longer to reply was because we wanted to give you an informed answer. We came up with a recipe for you and we tested it. Follow the same steps we used for the other Qamdi recipe. Thank you for your patience. Ramdan Karim. I love your website. My cooking is slowly improving (slowly, is the key word here). Insha’alah by the end of Ramadhan, I will be a much better cook. I wish you could see me watching the videos. I never paid that much attention to anthing in my life. On behalf of my family, we thank you for your effort. You made us laugh so hard! Thank you very much for your lovely comment. Ramadan Karim. Waan ku-faraxsan nahay inaad ka-faa’iidday. Annaga casharo online ma-bixino. Mahadsanid. Thank you for your nice compliment and for your excitement about the website. We hope you will like the recipes. There are different types of bur like bur macaan bur saliid and some people call qamdi bur qamdi. hi asalamucaleykum i really love ur website it has been really usefull to me especially in ramadam.I would like to ask you how to make burka dhaxda ka boqsan. Thank you very much for your comment. God willing, we will post the recipe you asked for. Ramadan Karim. Thank you! I did and they turned out wonderfully -even the next day left overs. My husband just munched on them all night long! Thank for letting us know, and thank you for your comments. I love your site! Thanks so much for taking the time out of your busy lives to post all these recipes for our benefit; it is much appreciated. I notice that you use the instant kind of yeast which typically you just add to dry ingredients; however you activated it here like one does with dry active yeast…so is it possible to use the latter since that’s what i have at the moment? Thank you very much for your kind comment. We are very happy that you like the website. Sometimes we like to test the yeast by activating it to make sure that it is still good. There should be no problem in using active dry yeast if you activate it. Thank you. A&l, Thank you for this recipe. My mother who departed in 2004, used to make this when I was a child but I never wanted to learn it from her, although I loved it. I have fond memories when I used to everytime snitch a few from the hot plate to my mother’s puzzlement. Now in my 40s and living abroad from Malaysia, I longed for the dishes that mom used to serve us and this is one of them. I looked for this bread recipe and found plenty but none as sweet as this, like she used to make them. Fry bread is not listed at all in any Malaysian or Indonesian (my mom’s heritage) recipe links. Funny how some dishes that Mom served originated from foreign countries. Just showed how worldly she was. God bless you. Thank you very much for sharing your thoughts of your mother with us. May God have mercy on her soul. We are always very happy to hear that our recipes bring back family memories. We are extremely delighted that the recipe worked well for you. Adigaa mahadda mudan walaal. Waan ku faraxnay inaad jeclaatay website-ka. Waa ku mahadsan tahay faallada. Thank you..it was very helpfull mash’allah. Thank you very much for your heart-warming comment and for your prayer for us. It really touched our hearts. We hope that God Almighty will always grant you more than what you pray for us. This recipe for Qamdi is a very good one and we hope you will like it. Insha’Allah for Ramadam we will try to do our best and hope God will help us. We love you too for the sake of God. Thank you very much for your immediate responding to my email last night. I just wanted to know guys if you have posted any where about how to cook “Sareen”. People from the north of somalia call it Qabadin. MaSha allah guys you are Nuur calaa Nuur . Oh! you meant Qamadi. We did not post it as yet, but it is on our to do list. Thank you for explaining what you meant. Asalamu alaikum. I also found this dry when I mixed it I had to add more water, and I used measuring cups. Could it be because I was mixing with my hands? Do you need less water when u use a mixer? Jazak Allahu Khair. It could be the way you measured the flour. If you packed the cups too much. Another reason could be the humidity. When the weather is very dry, you generally need to use more water with flour. We have added weight measurements for the ingredients which we hope will help. Ramadaan Kariim walaal. Haddaad 2 koob bur ka samaysid wax walba nus waa inaad isticmaashaa. Qamiirka qaadda weyn nuskeeda ama 1 qaadda yar iyo bar ayaa ku dari kartaa. Qaboojiyaha ilaa 3 maalmood ayuu ku jiri karaa. Mahadsanid. Tried the Mamri and they were v nice but not sweet enough. Hence, What is the maximum amount of sugar can I put in Mamri ? can I just use water n milk instead of eggs or coconut milk? Which cup measurement do you use? Ramadan Mubarak Sidika. Thank you for your comment. You can increase by a quater cup. Here is a recipe without eggs. The cup we use is 237 mL. Could I just use water instead of coconut milk? We believe they won’t be as soft. Coconut milk has oil in it, so it is better to use 1/4 cup oil and 1/4 cup water instead. Thank you, Ifrah, for your lovely comment. I have quick question, can I replace the water with cocunut milk? Yes, you can use coconut milk instead of water, but omit the oil. I love this recipe! I remember having this for Iftar every Ramadhan whilst in Nairobi before moving to the States. You guys do a wonderful service not only to native Somalis but to others interested in learning about our culture, of course via food . 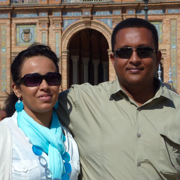 I know you posted earlier on that you both work full time, but opening your own authentic Somali restaurant would not be a far fetched idea! In fact, I am planning on opening one in Minneapolis, any takers?? Thank you very much for your nice comment, and thank you for your confidence in us. We wish you good luck. Thank you for this recipe. I don’t have yeast. Could I let it sit out overnight as you mention it was traditionally made? Any tips would be helpful. Thank you. You can use baking powder instead of the yeast. Mahadsanid walaal. Aad iyo aad ayaan ugu faraxsan nahay inaad jeclaatay. Qayr ayaan kuu rajaynaynaa. Mahadsanid walaal. Aad iyo aad ayaan ugu faraxsan nahay inaad jeclaatay. It is yeast that is used for a slow rise. Double-acting baking powder reacts immediately with the liquid in the dough and causes an initial rise. The second rise happens when the dough is subjected to heat. Letting the dough sit overnight with only baking powder, will not help it rise. In fact, you will lose some of the initial rise. That is why you need to bake cake batter as soon as possible after adding baking powder. I would like to make a large batch of qamdi, there was an earlier suggestion about refrigerating the dough a few days before. At what stage would I refrigerate the dough and how would I store it? After preparing the dough let it rise for 2 hours then divide into small balls. Refrigerate or freeze in a ziplock bag. Love your recipes and demonstrations. Tried these a few times (my family loves them). When the dough rests for the 30 minutes, they deflate when I pick them up to place then in the oil. Tried placing the ‘quarters’ on a floured and oiled surface, but to no avail. So most of them are not hollow. How can I prevent that? Did you let the dough rise for 2 hours first? Yes, I did leave the dough to rise for 2 hours. We have something very similar in my country (Trinidad & Tobago) called “float” but with less sugar. Thanks for the recipe. I followed this recipe step by step but they are not hollow. Any suggestions? I love your recipes mashaAllah! Do you think you could show us a baked version of these mahamri for those of us who are advised to stay away from deepfried foods? Thanks so much, i really enjoy your recipes and your videos!